Rate from one to ten: How real are Angry Birds? Is Second Life a place? Is LinkedIn your new counselor? Fill out our survey and register for our September 24, 2014 webinar on Digital Reality. How “real” is digital reality? When humans started to codify text, voice, or images in strings of 0 and 1, we entered a new Era. Never before had we been able to unify every language, every communication technique, every aspect of reality, into the same single code, nor had we been able to transmit messages representing images, words, movements or sounds as simple binary pulses. All of reality, with all its facets, can be now encapsulated into a simple alternation of “yes” and “no.” (Ok, maybe not so simple). One could consider that a clear division exists between “reality” and its “digital codification,” and that nobody would mistake a real flower for the code of a painted flower or the text of a written description of a flower. But humans have always seen a strong connection between an object or an animal and its representation: Neolithic painters captured the soul of their hunting prey on the deepest darkest wall of their caves. Plato’s students debated on the reality of the shadows in the cave, as ideas or objects. We reflect on the essence of art that is never to be seen or known by anyone. Soon, humans will have to decide about the “reality” of digital representation that will surround us at a level that we cannot imagine. 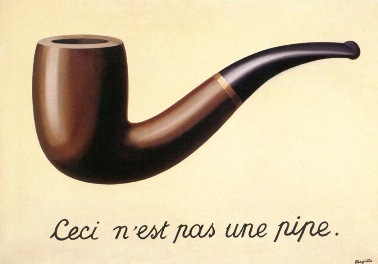 Magritte’s painting “Ceci n’est pas une pipe” points out the contrast between the individual’s cognitive perception of an idea and the object itself, and in the process he raises our consciousness of the expanded common cultural reality. A sentence like “the document you are reading is not the document we wrote” may elicit reflections on the essence of a digitally transmitted virtual document, but nobody will doubt that both are real. The malleability of digital information, however, takes our perception of “real” to a new level. For example, if we look at a pair of pictures of an object or person, and notice differences between them, we might assume that one has been modified. We say, “This is the real one,” even though both are simply digital representations of an image of the object, a series of zeros and ones. This seems to imply that our notions of the physical world and its digital representation are merging in our perceptions. Virtual Reality refers to a full computer-simulated environment that provides the impression of physical presence in places that imitate the real world or in imagined worlds. Although today it is primarily visual, virtual reality can recreate sensory experiences, including virtual taste, sight, smell, sound, touch, etc. Mixed reality refers to the ability to digitally enrich reality by adding or subtracting information, or otherwise manipulating one’s perception of reality through the use of a wearable or hand-held computing device such as a smart phone, tablet, or Google Glass. In mixed reality, the view of reality can be enlarged or diminished, for example to simplify a complex device or operation. Augmented Reality is the most commonly known case of mixed reality. It adds computer-generated sensory input such as sound, video, graphics, text, or GPS data to a view of a real-world environment. In a nutshell, while augmented reality technology functions by enhancing our current perception of the environment, virtual reality replaces the “real world” with a simulated one. How do these two types of altered perception influence the way we live and work? What do they mean for the future development of human culture and society? How are we going to use these simultaneous realities in our cognitive processes, learning strategies, recreation, and work routines? Will we get lost in digital reality? It is obvious that we perceive digital information through the same senses that access the physical environment. Eyes, hands, ears and other senses mediate our listening, viewing, touching, (and eventually even smelling) in digitally reproduced and transmitted information through the same brain that interprets physical information. We have 3D design software that lets us create a synthetic image that looks exactly like its physical double. With 3D printing, we can then make a physical version of the object that is identical in every way, but began its existence directly in digital encoding. We can photograph real objects, digitally manipulate them, and then print them (in 2D or 3D) to create new physical objects. The distinction between a “real” object and a “virtual” one is becoming ever more blurred as technological innovation progresses. Is this an opportunity to escape into an alternative gamified universe? Or does it open the door for expanded scientific research and cultural innovation that will lead us into new territories? Both options can move enormous amounts of money, but which will be more appealing for the next generations? The pleasure of discovery that goes together with any coding/decoding process, when we realise that beneath the layers of interfaces, codes, or communicative techniques, there is a meta-layer of additional information (e.g. accessing explanatory information, via an app, about historical sites in a city we are visiting). The process of understanding, which allows us to acquire additional information and to reinterpret previous knowledge in an expanded context (e.g. viewing the night sky through an app that identifies names of stars and constellations). Decision-making – a type of gamification, conscious or unconscious – that is implicit when accessing or using digital information that offers alternatives (e.g. choosing the “best” transit route from those offered, to go from point A to point B in a city). Imaginative power – to see through the human skin or inside the body, or to visualize the inner processes of plants, chemical reactions, or complex mechanics (e.g. the heart beating in a chest, that can now be used anywhere from school science classes to medical schools with nothing more than a mobile tablet). Merging realities might lead us to an extra-sensorial conceptualization of our environment. In such a world, culture would evolve with complementary layers of additional elements, big data and meta-information into a hyper-complex matrix of concepts and behaviours. While scientific studies have proved that children can distinguish at very early age between physical reality and imaginary fantasy,[i] the point is whether we’ll still be able to make such a distinction when augmented reality will be surrounding us in more evident and visual ways. How will we regulate the conquest of this new expanding reality? When Google Glass was introduced, the potential danger of distraction (when driving, crossing the street, etc.) was raised. The challenge of a higher level of awareness versus total distraction is still there. Augmented reality can simply superpose added data or it can deliver a superior experience that provides active interchange in diverse networks and sharing communities. The Internet of things will make both processes evolve faster and in a more automated manner. When videoconferencing eliminates the barrier of the screen, and participants can be holographs that interact sensorially, as if in the same room, we’ll need to adjust our sense of distance to a new reality with a new perception. In the end, we’ll develop new habits and routines in response to augmented reality inputs. Some of these will be specific to particular apps that we use regularly, and others will be adaptations of general social behaviours. Will we eventually ritualize official access to augmented reality by ruling about when and how we let children discover it? Will parents be expected to control children’s access to all forms of digital reality, the way we do now with television? Will schools be responsible for that? Will teachers be trained in augmented reality as an educational tool, to display alternative realities in different ways for different educational needs? Will we make laws, rules, and regulations about when we can use certain devices to switch in and out of virtual reality? Are we going to debate about who will be authorized to use digital information? Who will grant or deny such authorization? Digital reality is the way we have developed to integrate every element of the universe into uniform binary code, blending sensorial understanding and cognitive comprehension. As a result, we are embedded in a growing unknown universe of information. The human actions of looking, moving, and interacting are expanded into a contextually enriched culture in a digital realm. How are we going to project feelings, beliefs and behaviours in this new environment? How will augmented reality be affected (and used) by religious fanatics and fundamentalists? How are communities going to expand their dependency myths into the virtual world? How are users going to develop their differences, their scepticism, their ritualized conducts into those spaces? Every ecosystem has its own risks and instabilities. What risks and instabilities are inherent in the development of a society where digital reality is part of everyday existence? When it becomes banal, what will be the next new frontier? Our Adobe webinar on September 24th will be an opportunity to share your opinions on these issues. Answer our survey and join us! Share the post "[Guest Post] “Digital Reality – Escape to a Virtual World or Explore an Augmented Culture?”, by Ray Gallon and Neus Lorenzo"